Most people who have grappled with infertility have developed their own narratives about this experience and how it has shaped their lives. I often am amazed at how many people have found a silver lining in their infertility cloud. This past week has provided several experiences that heighten for me the connection between infertility and emotional resilience. My first experience was with a group of about 20 women, ages 25 to 60, who conduct workshops and training sessions in their communities about issues affecting families. They had asked me to speak with them about my book When You're Not Expecting, and I encouraged them to ask questions and offer observations during the course of my presentation. Well, I had only spoken a few moments when the conversation turned quite quickly to their own personal experiences with infertility. Who would have imagined that 15 of these women had difficulties conceiving, pregnancy lossses, or lived in a childfree marriage? No matter what the experience was for each, the way in which they shared their infertility experiences ultimately came down to "It's not what I expected, but I know I am a more understanding and compassionate adult because of learning how to come to terms with my infertility." Personal examples ranged from adapting professional goals so they could be more generous in helping troubled families to ways that they redefined their own families that put them in closer touch with young nieces and nephews. The tone of the meeting was definitely upbeat, although there was a fair amount of Kleenex passed around the table as various women delved into their emotions to connect with the shared topic of infertility. What struck me very poignantly was how each person disclosing her thoughts had moved from emotional pain to resilience as she found a new way of shaping her future than the one she initially had envisioned. My second experience this week occurred when I was interviewed live on our local public radio station about my book. Call-ins are a part of this particular radio hour and, once again, the callers shared their infertility and adoption experiences. One man expressed with zest how the pain of his infertility was eclipsed by the joy of adoption; a female caller spoke matter-of-factly about medical reasons that she could not risk a pregnancy, sharing her sadness that her husband's curly red hair wouldn't be passed along to their children, then moving on to talk about the emotional happiness her family shared 25 years ago as they adopted their two children. In both of these experiences I was taken with how easily people could delve into their pasts and retrieve memories of unanticipated reproductive losses, the need to regroup emotionally, the capacity to find a new pathway, and the emotional growth that they now attribute to their infertility journey. 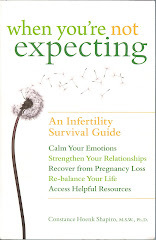 I hope this can be especially heartening to any readers who are trying to make sense of your own infertility, since it is clear that emotional upheaval is expectable, but emotional resilience also can be an outcome of infertility. Your readers may find the animated film, What to Expect when you aren't quite Expecting at http://www.ivfindia.com/movie/babymaking.html to be of interest !